It’s hard not to feel touched by the story of Alec, Becca and Syl and how they came to be a foursome with Gus. If you don’t know it already please go back through their pictures on @adventuresofsyl and read about how they got together, it really speaks to their generosity of both spirit and space! With that beings said we wanted to hear more from them about how they ended up living and travelling in their van, now with two dogs along side them. We’re originally from the South Lakes in the North of England but have lived in Wales for the past few years. Syl is from Wales and we found Gus wandering on the streets of Montenegro at about five weeks old 3 weeks ago. She has no name! For some reason nothing has stuck and now I have some kind of weird superstition that when we do it’s all going to go wrong so so far she remains nameless. Initially it was because I lost my job! Alec was allowed a years sabbatical and we’d always wanted to do something similar. There seemed to be so much freedom in travelling this way and as a real home-bird I liked the idea of taking our home with us. Plus we had Syl and it seemed like the easiest and best way to travel with a pup who we were obviously not going to leave behind! Once again the freedom – there’s no itinerary to stick to – if you love a spot stay there, if you don’t just move on. We have everything we need with us (in some cases a little too much stuff!) and nothing beats adventuring in the most amazing places and coming back to our little cosy home on wheels. 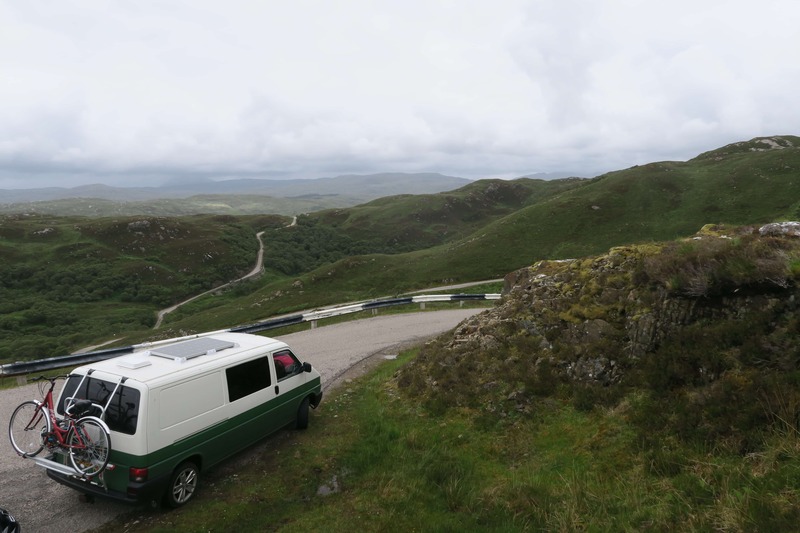 Plus all the other ‘vanlifers’ we’ve met have been just the nicest people, it’s been such a lovely experience meeting and talking to people having similar experiences and living the same lifestyle. We’ve not found anything too hard to be honest, we have a bigger van so nothing feels too cramped and a kitchen that wouldn’t be out of place in most apartments (in terms of size, probably not quality) complete with an oven so cooking isn’t actually any different. 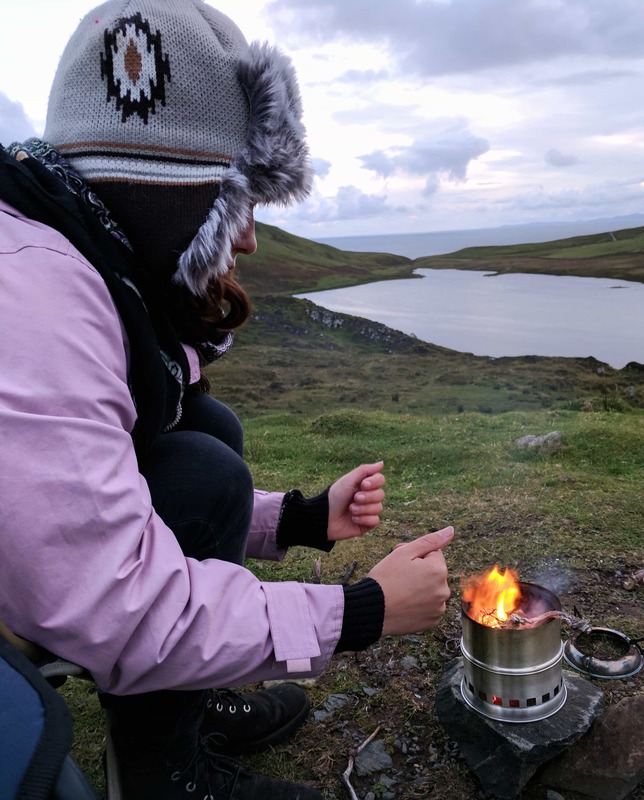 I suppose the hint for water has been the hardest thing – we don’t use campsites so are constantly looking out for a tap at a petrol station or somewhere where we can have a sneaky fill up! There’s also the fact we’re on such a tight budget I suppose as well – we only had a few months to get our acts together from me becoming unemployed in October to finding a van, buying a van, converting it and leaving in May. So there have been times where we wish we had a bot of spare cash to treat ourselves to a meal out or a little souvenir of our trip but it hasn’t been too bad. Also there’s always the inevitable – I miss my friends and family a lot but with Facebook, WhatsApp and Facetime it’s definitely not as bad as it could be. No idea! Alec would still be working at the Outward Bound I suppose and I’m not really sure, I have a background in biology and also renewable energy so maybe something along those lines but probably shop work which is what I was doing to tide us over after losing my job before we left. 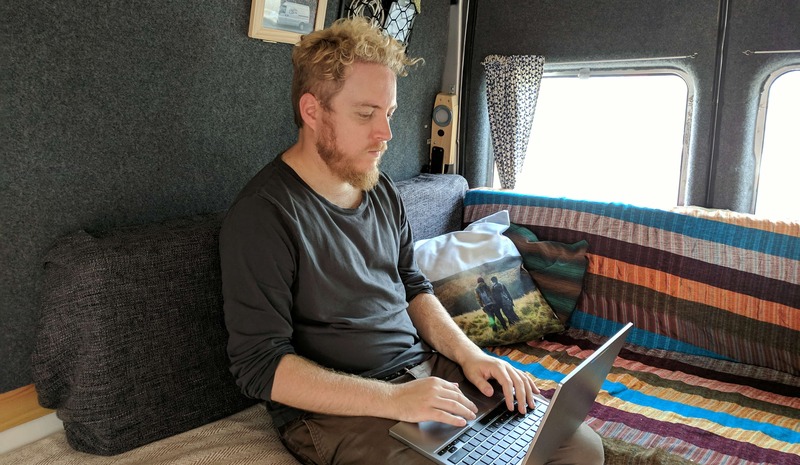 I also love to paint so I’d like to think I’d be doing a bit of that too but in reality living in a van has given me a much better scope to explore that than having a steady job ever would! Much as I hate to admit it (as Alec had to persuade me to get one) it’s probably the oven, it really means we don’t miss living in a house at all – plus pizza! Also I love how our worktops, which we made from old pallets, turned out and the fact we have a fixed bed and don’t have to make it everyday, it makes a real difference to us. Maybe how easy we’ve found it? Despite the occasional money worry it’s really taught us just to chill out about things. We caught our underslung water tank on a really steep edge off the road into a carpark in Norway and it ripped it totally off, getting stuck in front of the wheels and blocking the carpark in the process. We had to spend two days fashioning a new way of reattaching it and it stole time out of our stay in the Lofoten Islands but it was just one of those things that you can’t do anything about so there’s no point getting wound up. We’ve also barely argued (weird as we’re both really quite good at it! and the fact that such a small space doesn’t even feel small anymore. 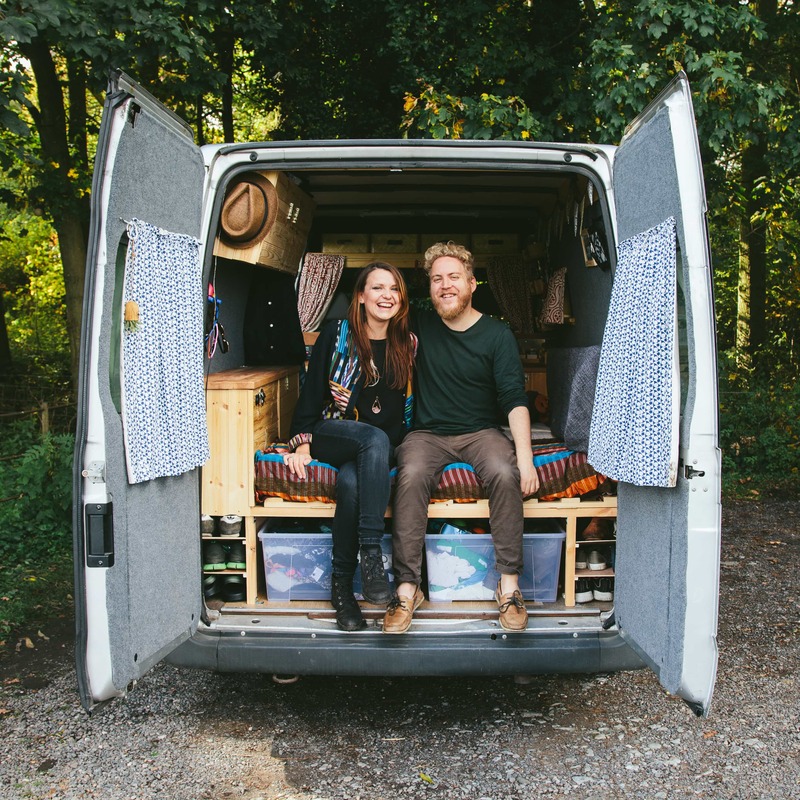 If you want to follow more of the stories of Alec, Becca, Syl and Gus head over to their instagram @adventuresofsyl as well as chekcing out their blog Drawing and Exploring where you can see some of the artwork Becca is making on the road!